England took a 1-0 lead in the Ashes series and ended a 75-year wait for a win against Australia at Lord's as they wrapped up a 115-run win before lunch on the final day of the second Test. 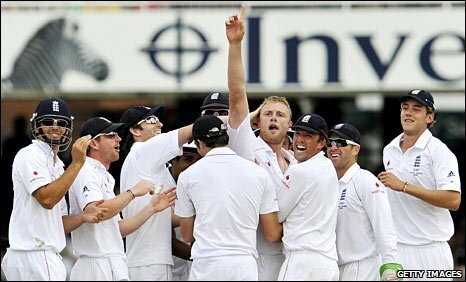 Andrew Flintoff, in his final Test appearance at the famous old ground, defied his injuries to take three of the five wickets England needed in an extraordinary 10-over spell to finish with 3-43 on the day and 5-92 in the innings. What promised to be a nervy morning for England fans soon became a more pleasant prospect when Flintoff, with a typically inspirational spell of Ashes bowling, picked up a wicket with his fourth ball of the day, the 10th in all. Flintoff had Brad Haddin, who had survived for more than three hours on Sunday, caught at second slip by Paul Collingwood for 80 and Australia were 313-6, still 209 runs away from completing an all-time record chase in a Test match. Mitchell Johnson came in and rode his luck, adding 43 with overnight hero Michael Clarke. 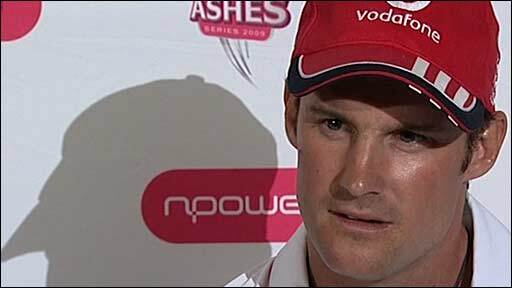 He eventually finished with 63, playing some fine shots towards the end, as Australia were bowled out for 406. But it was Clarke who was the second man to fall in the day, for 136, when he tried an ambitious shot in Graeme Swann's first over. By now, even the most pessimistic of England fans was scenting victory. And that mood became even brighter when Nathan Hauritz lasted only five balls before falling to the irrepressible Flintoff, who also dismissed Peter Siddle. Swann wrapped it all up, flattening Johnson's middle pole as the left-hander charged him. As well as being the first Ashes win for England at the home of cricket since 1934, it was also only their second since 1896. They now move on to the third Test at Edgbaston, which starts on 30 July, with all the initiative, while Australia will surely be forced into changes - with their seam bowling department expected to come under the microscope. There was a spectacular, expectant atmosphere at the start. Unusually, all tickets had been pre-sold for the final day of the match and with the members also turning out in force, only some of the corporate areas looked a little thin. England started with a ball that was six overs old and their overnight nerves were settled when Flintoff tested Haddin outside the off-stump and Collingwood held a low, but indisputably clean, catch. 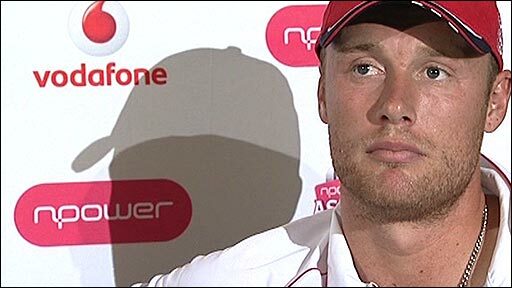 Flintoff continued to pose a threat with almost every delivery he bowled. Clarke did not look like a batsman with a century to his name, and by the time Johnson had reached four he had already enjoyed two lucky escapes. First, he nicked towards slip, the catch not quite carrying, and then an excellent lbw appeal had to be stifled by Rudi Koertzen's call of no-ball. James Anderson was not quite the same sort of threat and after three overs was replaced by Stuart Broad. Johnson edged but again the ball bounced just before reaching the slip cordon. The resulting single brought Clarke back on strike and he hit a beautiful off-drive for four. Strauss kept changing his bowlers at the Nursery End, and after three overs of Broad opted for the spin of Swann. It proved to be an inspired move. The off-spinner has developed quite a knack for taking wickets in the first over of a spell, and Clarke - who crucially had been kept quiet by the accurate seamers - felt the need to impose himself. 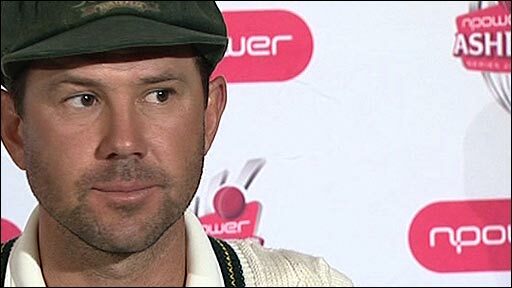 He skipped down the wicket, yorked himself, and the ball turned to clip off-stump. Soon afterwards, Hauritz compliantly chose to leave a Flintoff delivery that bowled him on the angle before Johnson got lucky again, Swann dropping a sharp caught-and-bowled chance. Australia were not about to give England any last-minute heartache, however. Flintoff beat the number 10 Siddle for pace, scuttling one into his stumps, leaving Johnson and last man Ben Hilfenhaus needing 134 for the win. That was never on the cards and with lunch still 20 minutes away Swann supplied the coup de grace.